There should have been sign that read, BEWARE, because a good many of the people who lived around the bend had earned their reputation of coming from the wrong side of the tracks. Ahead laid a tough-as-nails village in Southwestern Pennsylvania steel country where differences were often settled with fists and blood after its men downed shots of whiskey chased with union-brewed beer. Although most Webster folks were dirt poor, everyone within its tiny borders was white and everyone there wanted it to stay that way. 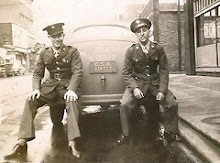 Many parents were satisfied when their sons obtained a 10th-grade education, and enlisted in the military or found work in the mills. Their daughters often got pregnant at 15, had shotgun weddings and immediately lost much hope for a better future. Webster’s forefathers surely had bigger dreams for the town they nestled along a sharp curve in the Monongahela River. 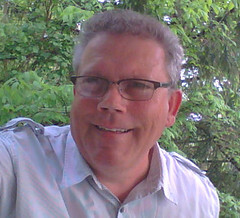 The God-fearing Christians included a German, Andrew Beazell, who was among the first to farm the fertile soil in 1773 before the United States made peace with the Indian Nation. Beazell’s son Benjamin would incorporate the town in 1833, naming it after orator Daniel Webster. Like Webster, the villagers were staunch nationalists. Its families had also supported President George Washington’s troops who camped in town to settle the Whiskey Rebellion in the 1790s. Neighbors boasted about their boatyard and its employee, Samuel Walker, who 20 years later built the first steamboat to chart the river. By then, the streets and houses had been laid out in Biblical fashion. The sun rose due east above every back door and set facing the front porches. Yards were separated by white picket fences, and most contained lush orchards and flower and vegetable gardens. Riverboat pilots dried their sea legs inside their mansions that were built with ornate trimmings to match the finest paddle boats of the day. 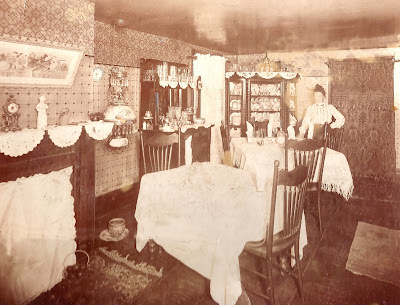 City dwellers in smoky Pittsburgh, 30 miles to the north, even traveled by boat to picnic and sunbathe along Webster’s shoreline and later rest up the road in one of four fancy hotels. 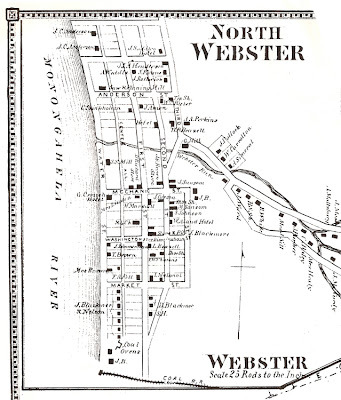 There were even plans for an opera house when Webster, with more than 2,000 residents, had become one of the largest settlements for miles. 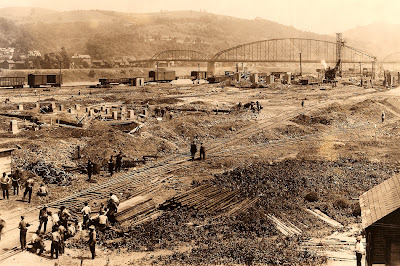 This utopia, however, was shattered after U.S. Steel Corp. began in 1901 to build a giant mill directly across the river and establish the Borough of Donora. Webster already had the coke ovens and a mill to supply its boatyards with iron. 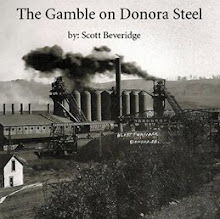 But, that operation was too small to compete with Pittsburgh coke and steel barons Henry Clay Frick and Andrew Carnegie when they came to Donora. So, the village began to dig deeper into its hillsides to find the coal to supply the new furnaces across the Mon. Webster’s riverboat captains, having witnessed how these giant mills had damaged other farms along their travels, immediately put their estates on the market. Anyone else with enough money soon followed their lead. In no time, Donora’s smokestacks were spewing the dirtiest air in the nation and would contribute to the infamous fluoride fog of October 1948 that killed 20 people and sickened hundreds of others. 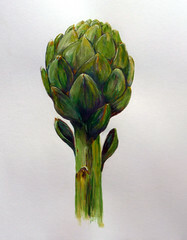 Poor Webster sat directly downwind of the fumes, which had eaten the paint off the houses and stripped the ground of its vegetation. That deadly smoggy weekend became known as America’s worst air pollution disaster, one that led to the nation’s first clear air legislation. 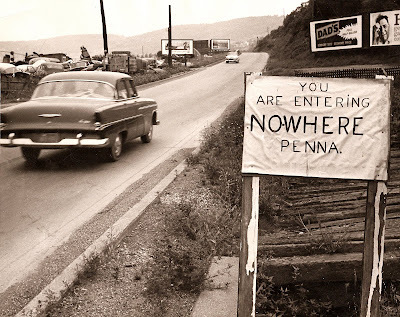 My parents, two brothers and I pulled into Webster to stay in the fall of 1960, a few years before Donora entered the history books again for becoming home to the first major steel mill to permanently shut down in the United States. This was not going to be a walk in the park.